April’s entries for Flash!Friday turned out to be quite a motley bunch. 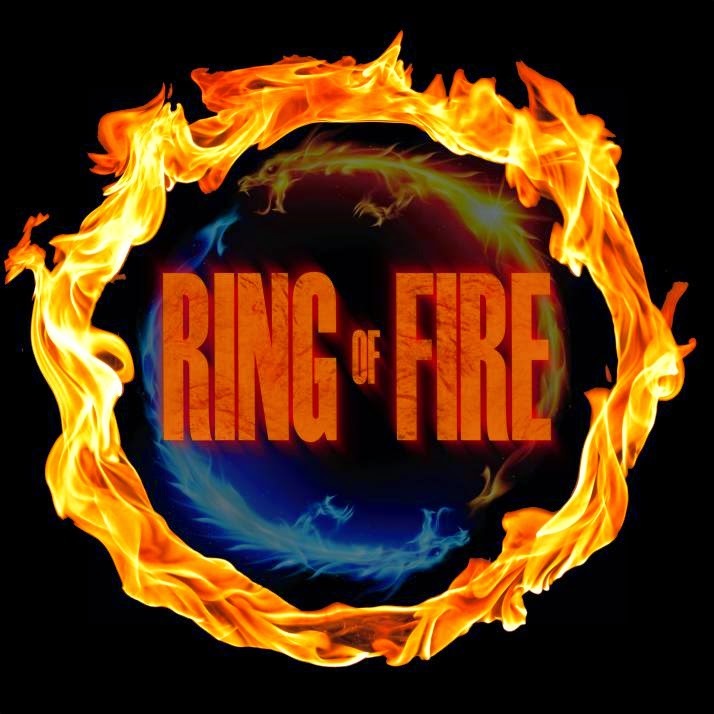 I received a special and honourable mention for two of the stories and received a “Ring of Fire” badge for taking part at least three times during April. I love the amount of writing practice these stories gives me every week and I hope you enjoy them. To see each story’s prompts, click on the titles to be taken to the individual pages. They can, however, be read without the prompts as well. Yesterday is the colour of an old photograph. The first sign of your love is white clouds at the beginning of spring. A vermilion rose is my love for you. A peacock feather’s rainbow is the flowers and gifts I give you. Bright sunlight is our first kiss. Betrayal is the colour of soot on glass. The same soot that now taints all I see. Fading love is cirrus cloud white turning into thunderstorm sky grey. Scarlet is the colour of my heartache. Hope for love to return is the colour of a candle flame. Gold and blue lightning is the colour of screamed words of anger. Goodbye is burning pitch; strangling words and tears alike in my throat. Silver is the knife of your words twisting inside me. Bruised skin purple is the colour of your new love. Sickly yellow-green bile is my anger and jealousy.Maggots and rotted black teeth is his look of glee, knowing my hurt. The carmine red of dried ox blood is my despair. The last goodbye is a city’s polluted night sky. Yesterday’s broken love is grainy photograph hidden in a drawer. When I recognise the man in the shadow coloured coat, I realise that more than a decade have passed on his side of the wall since he was told he had to leave. It feels like centuries have disappeared. At the kitchen window I wave at him and can see the haze of blue and grey glass buildings on his side of the world. But he doesn’t see me. The oven dings and I rush over to remove a new tray of cakes. Now that I know he’s here, I start on a new batch of batter; all golden eggs and silver apples. His childhood favourite. I make snow white frosting flavoured with summer roses. Flakes of crayon-yellow sunshine glitter on top. An apprehensive hand grips my heart. Almost none return here. They disbelieve every memory of magic. They start believing none of this matter. They become hollow. Clutching hope in my chest, I put the tray of frosted cakes by the open window and let the fresh smell drift into the air. I wait, hands trembling. Fidgeting. Every second stretches to a year. Then he looks around at the familiar smell and smiles like a child; released from the glass and smog world for a while. I know the Nithin can see me where I’m sitting on the corner of the street. It was foolishly stupid of me to sneak so close when I know they can spot me – even though the shadow cloak worked with charms of invisibility hides me from other eyes. But it was my ticket to learn the truth. Now I know how they make their poison. Now I know that my best friend has been helping them. I’’d recognise the Dragon’s Bane plant anywhere. Her family’s safety bought with a bunch of thorny leaves, berries, and roots at the expense of ours. I want to throw myself at her. Claw at her. Curse her for being a traitor and murderer. The Nithin steps closer in order to see my face, but a mask of white clay hides my features. A ball of paper wrapped around a dragon tear buys me time as I throw it on the cobbles and let it pour forth a veil of acrid smoke. Panic grips the closest people and I run with the knowledge of how to save my people. No longer will people accept the Nithin and their magical hold on life and death here in Agraver. I don’t know where I am. The place looks familiar in a time-twisted sort of way. The shop over there should be the bakery. The sweet shop across from me. But they’re gone, suddenly, disappeared overnight. Someone came to change everything. “Crazy crone,” someone mutters as they walk past. Why is the sweet shop selling gambling tickets? I want to play, but I feel drained. My mind feels strange. Someone changed everything. I wonder why I’m sitting on the cobbles. I should be at home where it’s warm. In my hand is a piece of chalk. Next to me, in a cup, more pieces. There’s a picture on the cobbles of a house with a tree and a family. It looks like it was drawn by a child, but I don’t see any children close by. My fingers are covered in coloured chalk dust. I don’t know where I am. The sweet shop is gone, but I have chalk to draw with. None of the other kids want to play with me. A beautiful lady in a silver dress comes to sit next to me. The gods’ mountain towered in the desert, spilling sand from its peak. In hidden furnaces the glass life-shell hourglasses of mortals were formed before being sent into the scorching sun to be filled with the falling sand. And the Fillers at the foot of the mountain became immortal as life seeped from the sand into their pores. He poured a few grains into a tiny glass and handed it to the sightless Gatherer. He knew what such a tiny hourglass meant – mother and child would run out of time together. At his age he could no longer stop the tears. Knowing how much time a person had to live wasn’t right. Just last week they’d filled thousands of life-shells belonging to those who’d all die in the same war. How many glasses had he filled of people who would die in their sleep? That night he scooped sand into a bag, swung it over his shoulder, and headed out to where the Gatherers kept the hourglasses. Rows upon rows of life-shells were hidden inside the Gatherers’ caves. He took the first hourglass and added more sand. When he came to the tenth, the hourglasses rattled, cracked and then one after the other exploded. He dropped the sand. And ran.